I’ve never cooked with chipotles before and I don’t know why they haven’t become a more popular feature here as they are in the States. The heat is like a warm glow that surrounds your mouth and jaw and it makes you feel like everything is alright (or maybe that was the tequila). The gentle but insistent warmth of this dish is perfect for those who love spice but don’t enjoy getting their taste buds decimated in the process. This recipe is easy and perfect for anyone looking to expand their repertoire and eat authentic Mexican that doesn’t come from a packet. Dried chillies are not all “hot.” Mostly I would describe them as warm and giving what I’d call a pleasant glowing tingle in your mouth. 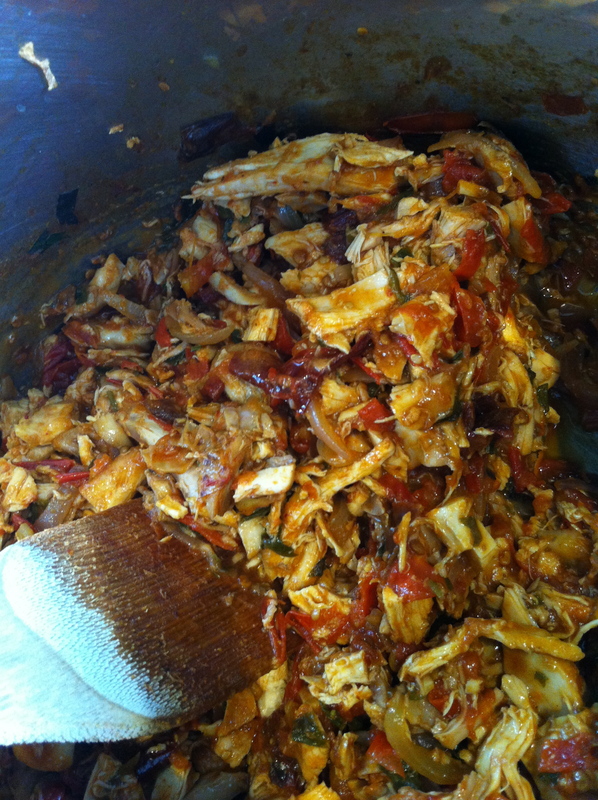 For this traditional Mexican dish called chicken tinga – I used the tinned adobo chipotle chilli. Chipotles are actually jalapenos left to ripen until they are dark red and ‘adobo’ is the word used for the process of turning a raw ingredient, like a chilli, into a concentrated paste using paprika, oregano, salt, garlic, and vinegar to preserve and enhance its flavour. 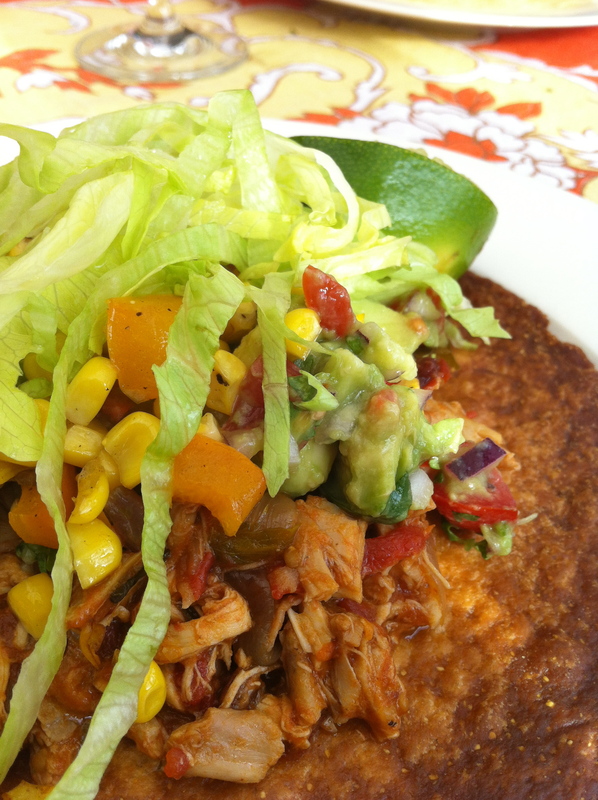 Here’s another tid-bit, tortillas are supposed to be made with corn flour, not wheat flour. I noticed that most grocery stores have mostly wheat flour tortillas in their selection, but I managed to find one packet of Old El Paso corn tortillas which we in the west use mainly for burritos. To make your own tostadas – which are far superior to pre-toasted ones – simply let your corn tortillas go stale (leave them out of their packaging for a day), and then fry them in oil until they’re crispy. They won’t have the texture and crunch factor of the taco, but rather a softer crunch with much more flavour. I got my recipe from a terrific Mexican food blog called Mexico in My Kitchen where school teacher Mely Martinez shares recipes she cooks at home for her sons. In a sauce pan, saute the onion, garlic and chipotles in some olive oil. Add the chopped tomatoes and parsley and lower the heat. Cook out till the tomatoes release their juices, about 7 minutes. Add the chicken and simmer for about ten minutes, add some water if necessary to keep the stew wet but not watery. Serve with tortillas, tacos or tostadas, and lots of garnishes like corn succotash, fresh lime, crisp iceberg lettuce, guacamole and salsa.